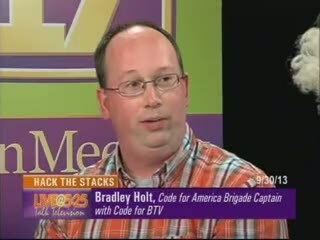 Burlington Vermont has been selected for the Code for America Brigade. The group will build civic apps and open data projects for community purposes. As part of the national network Code for BTV will collaborate with local governments to use technology to solve problems. Thirty-one communities across the country are part of the Code for America Brigade. The next major Code for BTV event will be a hackathon, slated for Saturday October 26th and Sunday, October 27th. Called Hack the Stacks: Civic Hacking at Fletcher Free Library. The focus of this project will be creating apps for the Fletcher Free Library, working with Big Heavy World to promote Vermont-made music, and building websites for Vermont's nonprofit organizations in collaboration with the Vermont Digital Economy Project.